The February 2018 meeting of the HPMS was called to order at 7:00 P.M. on 5 February. There were 12 attendees. The meeting was officiated by Dave as Andy, our president is recuperating from the flu. 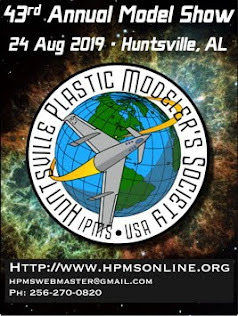 There has been no response from the Phoenix Chapter of IPMS regarding our request to sponsor trophy packages. The comment was made that it appears the Phoenix Chapter is late in establishing a convention website. A report was made on the January 2018 chapter swap meeting, some transactions took place and six people attended. The date for Hamacon has not been determined and the chapter role in this function has not been set. As in past dealings with this function we have the information sent the chapter at a later date. The application for a business license for our 2018 show and contest has been submitted and Dave will monitor that process. The art work for the show and contest flyers has yet to accomplished, Tom Clark is the POC for this. Flyers can be found here. A new function has been opened at Lowe Mill with a media room, 3D printer, and wood carving equipment. As with a previous establishment of this nature located in Madison there is a graduated membership fee. The establishment is called the 'New Librarian'. Martin Burkey - Bandai 1/72 scale Millennium Falcon, Shapeways Romulan Warbird, Model Art NF-104A conversion and a Ugh Models 1/2500 scale Ivaiex Warbird. Phil Cassibry - Zoukei Mura 1/48 scale F-4C Phantom, Furball Aero Design Decals Sheet No. 48-032. This sheet has the markings for F-4C number 64-0693 credited with the 1st confirmed USAF Mig kill of the Vietnam War. Color scheme is ADC Gray over White. Bruce O'Gorman - Purple UFO with strobe light and "over the hill" Ford Model 'A' Coupe. The Model 'A' is a 'work in progress'. M. E. Mueller - 1/35 scale Tamiya M-4 Sherman Tank, modified return rollers, carries earlier type track, modified gun mount from M-34A1 mount to earlier M-34 for an aftermarket turret.